THE tooth fairy deserves to get frequent flyer points for the numerous visits to our house. She came twice last weekend. It’s an expensive time for her (or is it him? ), when a child has reached five or six, and their baby teeth start dropping out. The going rate for teeth has traditionally been £1, meaning the tooth fairy will have to shell out £80 for all my children’s milk teeth over the years. Billy, aged six and 11-months, has got five wobbly teeth at the moment, after the most precarious front top tooth finally became separated from his gob. It’s been hanging on for at least a fortnight. Usually, you can give a very wobbly tooth a quick twist and it will come away easily. Not Billy’s. His seem to become detached only on one side. We had to get the dentist to take one the last wobbler out. This time the tooth came out in rather dramatic circumstances. A nice day out to Brixworth Country Park was on the cards, but as he went to jump out of the back of our ancient Bongo campervan he fell face-first into the gravel. Ouch. Forgetting all the first-aid principles of not moving the patient, I scooped him up and sat him back into the van just as his wails hit an ear-splitting volume. He was so concerned about getting plasters on his grazed knees and elbows, he hadn’t realised his mouth was pouring blood. With wet-wipe ‘cold compresses’ being held on his limbs by his concerned brothers, and Fairy Godmother Aunty Nicki distracting a distressed Bonnie, I got a look at his mouth. 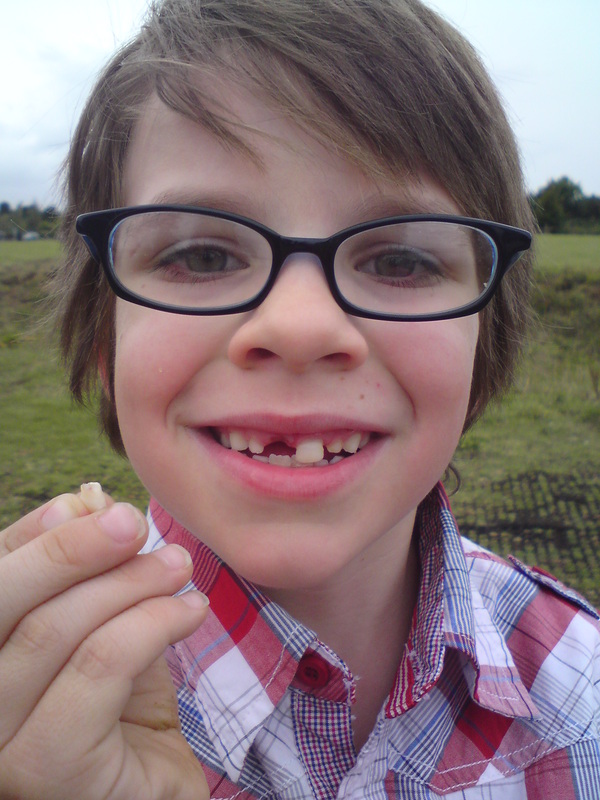 “Oh, at least your tooth is out,” said concerned elder brother. “Yeah, but has he swallowed it?” asked concerned eldest brother. The wailing started again. The brothers grim were given the task of trying to find the missing tooth among the white tooth-sized gravel where he’d fallen. Amazingly, sharp-eyed Jed did find it. And thankfully the rest of Billy’s teeth, including the new tooth breaking through, were all intact. Insult was added to injury when the tooth fairy missed out Billy on her nightly rounds. She was obliged to pay time and a half the following night to meet contractual obligations. (Don’t know about you but the absent-minded tooth fairy has missed teeth in our house on more than one occasion). Over breakfast the following day, Dougie suddenly announced that he too had lost another tooth overnight, but had decided not to put it under his pillow as he wanted to keep it “and I’d rather have it than a quid.” He’s 11. haven’t all his baby teeth already come out? He showed me where a new molar was growing in its place. Turns out children’s 20 milk teeth keep falling out until they are around 12. Jed’s just had his last adult teeth break through, just as he’s coming to the end of wearing a brace and his teeth seem to be all in the right place. With all this palaver about teeth, baby Bonnie wants to get involved. “My teeth out for the fairy?” she asked, as I was getting her ready for bed. I solemnly examined inside her mouth. Her last milk molars at the back are just breaking through. “Not ready yet darling, soon.” (‘soon’ being the unit of time used on Bonnie for everything). If your child is unfortunate enough to lose a tooth when it’s not wobbly, the old tip of washing it in milk and sticking it back in is actually true. It needs to be reinserted within 30 minutes, or kept in the milk, and an emergency dentist trip sought immediately. Don’t think it doesn’t matter if a baby tooth comes out too soon, the tooth needs to be there as a ‘spacer’ until the adult teeth are ready to erupt.